Aqualand Torremolinos, previously known as Aquapark, is a water park situated in Torremolinos and only 15 minutes away from the centre where both the train station and the bus station are located. In this water park we can enjoy the fun and entertainment that the biggest water park on the Costa del Sol provides, where we’ll find numerous water rides amongst which we’ll be able to experience the latest attraction, the 'Boomerang'. Aqualand Torremolinos has a restaurant, several stands, green areas, sunbeds and even an 18-hole mini-golf. Amongst the most popular attractions we’ll find the wave pool surrounded by green areas and sunbeds, a playground for kids and a Jacuzzi-style pool where we can relax as long as we want. In the souvenir shop we’ll be able to purchase a bottle of sun cream in case we’ve forgotten to pack our own (something essential), swimming gear, towels and other souvenirs to remind us of our experience in this park. In May, June and September it opens from 11 am till 6 pm. 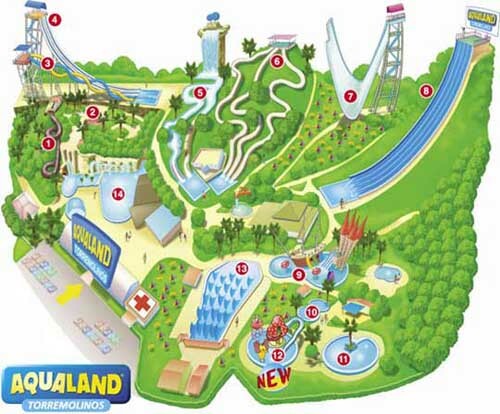 July and August are the months of high season in which the water park opens from 10 am till 7 pm. If you decide to get to Aqualand Torremolinos by car, the premises offers free parking outside. It can also be reached on foot from the Montemar train station or from the one in the centre in La Nogalera, only a 15 min. walk away. The exact location is: C/Cuba, n.10, 29620 Torremolinos, Málaga. Very near the Torremolinos Conference Hall and the Crocodile Park.